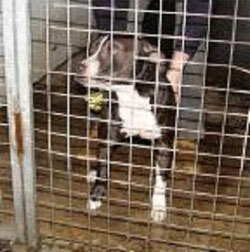 The biggest problem faced in rescue at present, is what has come to be known as The Staffie Epidemic. It is currently estimated that out of the 9000 dogs destroyed last year at the dog compound, over a third were Staffordshire Bull Terriers or Staffie Crosses! Due to popular demand, the Staffordshire Bull Terrier has been over bred by people simply looking to make ‘a cheap buck’. Unscrupulous backstreet breeders, often with little understanding of the breed, have bred the Stafford and sold the cute puppies, to unsuitable homes, with little concern for the dog’s future! Staffies have become a fashion accessory of the youth. They are popular because of their tremendous characters. Sadly many of these young homes are instable and uncertain. Many youths have found themselves unable to meet the demands and responsibilities of this energetic dog and sadly a high number of Staffies become social discards before their 1st birthday. The pounds are full of them, rescues are brimming with them, some rescues are so full of them they are forced to leave them behind in the pounds! Sadly very few Staffies are given the chance to see their 2nd birthday!!! The result of years of over breeding has left the rescue world with literally an epidemic of unwanted Staffies. Staffies have mainly been exploited for puppy cash and sold as status symbols offering a macho image. This has in turn given the Staffie a ‘bad reputation’ as being an untrustworthy dog, making them a difficult breed for rescues to rehome. Nothing could be further from the truth! The Stafford is an energetic, fun, people and dog loving, sociable breed. We invite anyone who is cautious of the Stafford to make an appointment and come and meet some of our Staffies. We are sure our Ruby and Co. can change your perception! Please do not rule out a Stafford when looking for a rescue dog. These dogs desperately need our help. We are uniting with many rescue’s to combat this problem. Please download the following poster and display it in your local vets and pet shops. Please help educate people in the plight of our Staffies. We are there for these friends in need who will hopefully make you a friend in deed!! !